The craft metal we ship has a bright brushed metal/satin finish. The soft brushed finish of raw copper & brass will gain a rich natural patina with time. They also can be cleaned occasionally and coated with paste wax or clear lacquers to preserve the original finish. With weathering, the copper will first turn a rich red bronze color and eventually progress to a green or blue green/turquoise color. Brass is slower to change into its mellow greenish brown bronze color with flecks of blue. This coloration is called 'patina' which is actually a thin layer of oxidation on the surface or the metal. The distinctive green color of aged copper is called 'verdigris'. The most famous example of this is the Statue of Liberty. Natural patinas acquired over time are deeper, richer and more durable color. Copper roofs may last many hundreds of years. It is possible to speed up the natural patina process somewhat by exposing the item to a coastal salt air environment or placing the item near a swimming pool where it will be exposed to the chlorine in the air. A faster method of obtaining different colored patinas is to apply a commercial patina solution. Patina solutions are available in the paint departments of most craft and hardware stores. Caution should be used as these chemicals are corrosive and must be used in a well ventilated area. Never allow children to handle these. It is best to patina an item after it has been crafted. Pre -patinated metal will show shiny areas every where the metal is bent, hammered, or stretched. In addition soldering will be impossible and the patina will discolor where heated. The first step obtaining a successful patina or finish on copper and brass is to thoroughly clean the item to be patinated. The surface must be free of any grease or oil (including that from fingerprints) and in a bare metal state. Grease and oil can be removed with dish washing detergent and a brush or rag. The metal should then be cleaned with an abrasive pad, or a small brush (such as a tooth brush) and an abrasive metal cleanser such as Bar Keeper's Friend. Metal cleansers contain a mild powdered acid that is activated by water and removes surface oxidation. Metal cleansers can be found where other house hold cleaning supplied are sold. Once the metal has been prepared, follow the directions that come with the commercial patina solution. Paste wax or Lacquer can be applied to the cleaned bare metal once it has been thoroughly dried. If moisture is trapped under the finish coating it will tarnish. 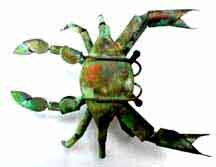 Coppersmiths in the 1800s used to pack the cleaned piece in hot saw dust to remove the moisture. Today lighting fixture and faucet manufacturers go to great lengths to prepare, clean and dry their brass fixtures for the lacquer coating that keeps them looking bright as long as possible. 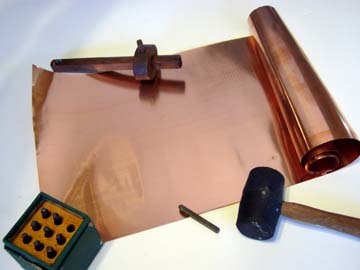 It is our experience that a permanent clear coating for brass and copper is very difficult if not impossible to obtain. Periodic cleaning and re-coating is always necessary. 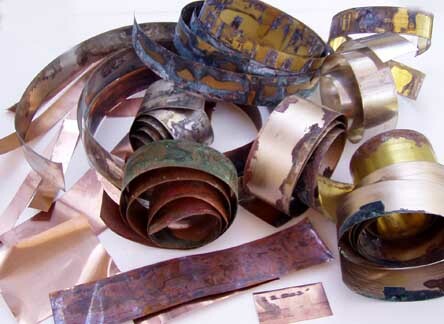 There are specific brass and copper lacquers commercially available that are purported to last longer. Incralac is used by many sculptors use. One maker: CAP industries 543 Staunton St, Piqua OH 45356 They may have to be removed and reapplied if the metal tarnishes under the coating. For colored metal many dip or paint our craft metal with their choice colors. This way there are there are thousands of color choices with different spray paints and liquid paints. Check the label to see which ones coat metal best. 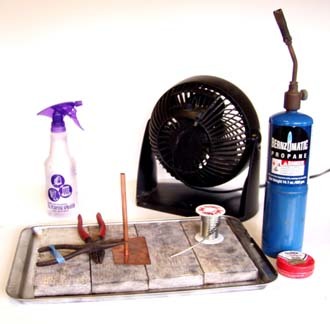 Cleaning the metal with a solvent will improve results. A quick primer may help. We like "Rustoleum" brand for metal. Also auto body paint colors offer many colors and special effects. The entire contents of this site and photographs shown herein are original and copyright protected.